Do I need an MSIC? If you work within Australia in the offshore or maritime industries, chances are that you will need a Maritime Security Identification Card. An MSIC is a Commonwealth approved form of identity which shows that the holder has met the security requirements to work unmonitored in a designated maritime security zone. 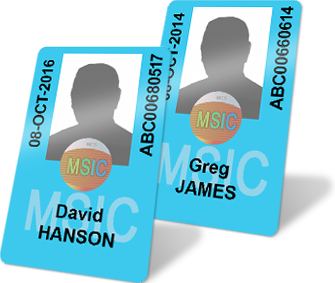 If your employer or facility has identified your need to obtain an MSIC, we can assist you to apply for your MSIC card. It generally takes around 10 - 15 minutes to apply for your MSIC. Cards for approved applicants can be issued in about 1 - 2 weeks from when we receive your application forms and identity documents. Our MSIC program is managed in accordance with the Commonwealth of Australia Maritime Transport and Offshore Facilities Security Regulations 2003. We achieve the fastest turnaround times for you through our automated processing system and on site card production facility. Need an MSIC for employment purposes? In May 2005, the Australian Government introduced amendments to the Maritime Transport Security Act 2003 in Federal Parliament in an effort to further secure the nation's maritime and offshore industries. These amendments have led to the introduction of Maritime Security Identification Cards (MSIC) which ensure that those persons working in these critical industries are subject to appropriate background checks. Since 1 January 2007, all personnel requiring unmonitored access to a maritime or offshore security zone are required to display an MSIC. What is a Maritime Security Zone? restricting access to specified areas including critical installations. What is an Operational Need? A person has an "Operational Need" to hold an MSIC if his or her occupation or business interests require, or will require, him or her to have unmonitored access to a maritime security zone at least once a year. people who work on and/or supply offshore oil and gas facilities. A person has an adverse criminal record if he or she has been convicted of a Maritime-security-relevant offence (MSRO) and sentenced to imprisonment (including a suspended sentence, periodic detention, home-based detention, and detention until the rising of the court). If you are seeking employment which works in or supports the maritime and offshore industries and your role will require unescorted access to a Maritime Security Zone (MSZ) at least once a year, then you can apply for an MSIC. The application process will assist you in determining your Operational Need requirement for an MSIC. applyMSIC.com.au's online application process will guide you through each of these eligibility requirements. Upon completion of your online form, you will be required to print your application, gather your necessary identity documents, and have a Justice of the Peace certify your documents. Once complete, post all items to us and we will process your application upon receipt.